Only a very brave writer, or a very foolish one, would begin a novel with the words “What is art?” The British novelist Rachel Cusk is no fool, and indeed there is both courage and ambition on display throughout The Bradshaw Variations, her seventh novel, which is indebted to and in conversation with Tolstoy’s novella The Kreutzer Sonata, as well as his less well known 1896 nonfiction work, What is Art? As Zadie Smith demonstrated with On Beauty, which owed similar debts to Howards End, when a talented novelist seeks to reconceive yesterday’s masterpieces through a contemporary prism, there is potentially much to be gained. Using the three Bradshaw brothers Thomas, Howard and Leo as the root, third and fifth of her tonic chord, Cusk examines Tolstoy’s assertion that art is based “upon this capacity of man to receive another man’s expression of feeling and experience those feelings himself.” In a series of delicate and finely observed scenes, her characters generally fail that essential empathy, and with it their art, both created and lived, also fails. Over the course of the story, which spans a year, Thomas has decided to spend a year at home, learning the piano, while his restless wife Tonie accepts a promotion that returns her to the workforce, leaving him to care for their seven-year-old daughter Alexa; Howard, a successful businessman, experiences a health scare — a spot on his lung — while trying to manage his neurotic wife Claudia’s disappointments and frustrations. Leo, the mild youngest brother, and his alcoholic wife Susie are gestured at and then largely abandoned. But the presence of an elder generation of unhappy and dysfunctional parents suggests that, no matter what the generational trappings, the song remains the same. It strikes her now that life is not linear, a journey, a passage, but a static process of irreversible accretion. It is a perspective that moves, passing over it all like the sun, now illuminating, now casting into shadow. The angle changes, the relation of one thing to another, the proportion of dark to light; but experience itself is block-like, is cumulative and fixed. Declamatory sections like this one are a shame because, besides being tedious reading — especially when they come hard upon one another as they do here — these unwelcome authorial intrusions choke a narrative that otherwise unfolds with subtlety and grace. That may well be part of The Bradshaw Variations’ game — as the title and the opening question suggest, this is a book with a keen self-awareness about art and the artist’s role in creation (as well as in self-creation, particularly among the novel’s women). But one never escapes the feeling that there are two books uneasily joined here, an artful domestic drama married to a manifesto on creativity and its discontents, and one wishes Cusk hadn’t hammered home the latter so relentlessly. In the end, this slim but overstuffed novel rests heavily upon its overworked conceit, bending precariously beneath the weight Cusk places on it. It’s the sort of book in which a character happens to be reading a thematically relevant story — in this case, The Kreutzer Sonata itself — at a key moment. (“What is art?” is also clearly intended to echo Tolstoy’s opening, “What is love?” another question Cusk grapples with. Trains, which play a big part in Tolstoy, punctuate Cusk’s novel as well. And so on.) 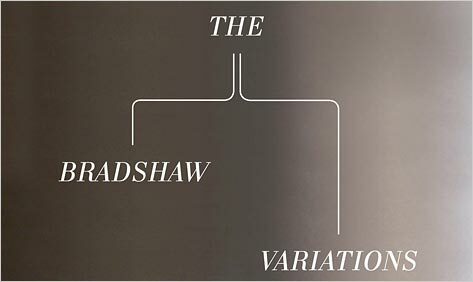 The Bradshaw Variations feels very much like a novel built around A Big Idea, a worthy authorial impulse but one that sacrifices the lovely half-book lurking in there somewhere. Mark Sarvas is the author of the novel Harry, Revised.